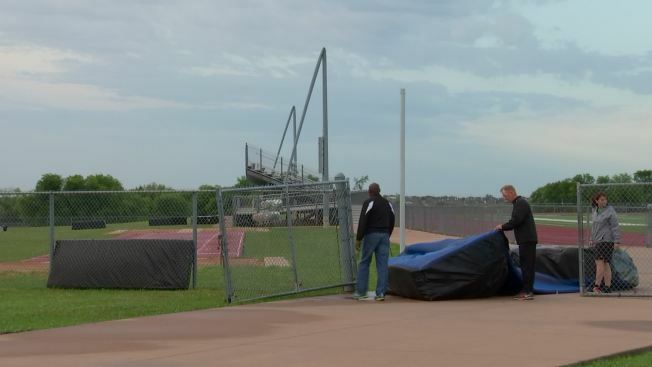 Extensive damage caused by Wednesday’s storms has forced Arlington’s Seguin High School to move a baseball game scheduled for Friday. Strong wind completely ripped the roof off of a dugout at the Seguin baseball field, and it bent two large light poles in half. Instead of being played at its home field on Friday, the Seguin varsity baseball team will play its game in Burleson. Contractors have already been at the field cleaning up the debris that had been scattered across the facility, and are expected to replace the damaged light poles on Friday, according to Leslie Johnston, an Arlington Independent School District spokesperson. If the repair work is not completed by Monday, the district also has a backup plan in place for another home game that is scheduled for that day.